On the fifth-annual Poor Man's Movie Awards, Kevin Allen, Kevin Reed, Joey, and Scotty talk about the best and their favorite movies of 2018. The verdict portion consists of the biggest surprises and letdowns of the year, and then we proceed into the regular awards for the films of the year. On this episode, Poor Man's comic-book consultant Kyle Bagwell makes a triumphant return to talk with Joey and Kevin about the new animated Spider-Man movie. Also, Scotty was supposed to be on, but we forgot about him: so we threw his verdict in at the very end. Oops! Brad, Joey, and Producer Galen talk about the latest film in the 'Dragon Tattoo' series. 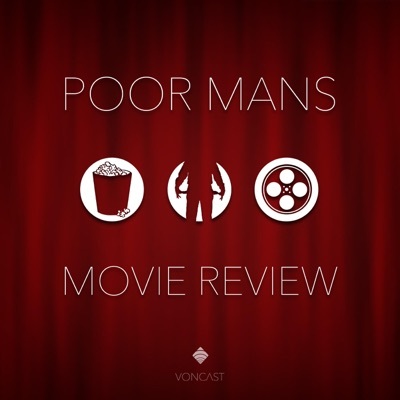 Joey, Kevin, Wes, and Michael Myers are back again on this week's episode of Poor Man's Movie Review. Brad, Joey, and Producer Galen talk about The Predator. Joey and Kevin sit down to discuss the likely winner of this year's Oscar for 'Best Giant Shark Movie Starring Jason Statham'. In Joey's absence, Producer Galen just tries to keep the wheels from coming off. The summer of sequels continues as Grant and Kevin join to discuss the sequel to Sicario. On the third installment of The Summer of Sequels, Joey, Kevin, Scotty, and Wes talk about the latest that Disney's Star Wars franchise has to offer. On the second half of the first Poor Man's Movie Review double-feature, Brad, Grant, Joey, and Producer Galen talk about the Super Troopers sequel. Jenna, Joey, Kevin, and Producer Galen talk about the almost divisive, but actually unanimous, Thoroughbreds. Scotty joins Joey, Kevin, and Wes to talk about the eighth Fast and the Furious movie. Joey, Kevin, and Wes discuss the latest Marvel movie. Joey, Kevin, Kyle, and Wes talk about Marvel's latest installment. The gang discusses the highly-anticipated, highly-marketed fresh take on the comic book genre from first-time director Tim Miller. Tommy Hans joins Joey and Wes to talk about Adam McKay's The Big Short. While Kevin and Wes stay at home in bed nursing New Year's hangovers, Voncast Network history is made as Producer Galen goes on mic with Joey and Kyle to discuss the eighth film by Quentin Tarantino.